What is a native plant community? A native plant community is a group of native plants that interact with each other and with their environment in ways not greatly altered by modern human activity or by introduced organisms. These groups of native plant species form recognizable units, such as oak savannas, pine forests, or marshes, that tend to repeat over space and time. Native plant communities are classified and described by considering vegetation, hydrology, landforms, soils, and natural disturbance regimes. Examples of natural disturbances include wildfires, severe droughts, windstorms, and floods. Sometimes referred to as native habitats or natural communities, native plant communities are named for the characteristic plant species within them or for characteristic environmental features. 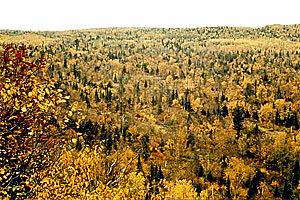 Examples of native plant communities in Minnesota include Dry Barrens Oak Savanna, Red Pine-White Pine Forest, Bulrush Marsh, Sedge Meadow, and Mesic Sandstone Cliff. There are many kinds of vegetated areas that are not native plant communities. These include places where native species have largely been replaced by exotic or invasive species such as smooth brome grass, buckthorn, and purple loosestrife, and planted areas such as orchards, pine plantations, golf courses, and lawns. Other areas not considered to be native plant communities include areas where modern human activities such as farming, overgrazing, non-sustainable logging, and development have destroyed or greatly altered the vegetation.